VIRGIN RECORDS in Sheffield was one of the first dozen stores opened by Richard Branson, following the establishment of his original store above a shoe shop in Oxford Road in London in early 1971. A second shop followed in Notting Hill and then the name was rolled out nationwide, with a dozen new shops, though lots of music fans were already aware of the name thanks to their very popular mail-order operation which offered “5 to 15 bob off ANY album on ANY label” via full-page adverts in the music press, a discount made possible by the abolition of the RRP or recommended retail price (which had kept a level playing field for stores, and would arguably have meant we still had a thriving retail scene today if it hadn’t gone) in 1970. I originally thought the Sheffield branch was open by the summer of 1971, in a new parade of low rise shops which had gone up on a largely derelict area still awaiting redevelopment following destruction in the war. The official address was 137 The Moor. It now looks as if it was more likely to have opened in 1973. It was quite a basic affair but from the start the place had a cachet about it. There was certainly something a little risqué about the name, and the suggestive illustrations which sometimes decorated their window, which gave the store a grown-up feel. It was clearly a cool shop and very different to anything we’d seen before. They had joss sticks going. They had aircraft seats to lounge in, and they had big red headphones to listen to albums on while you lounged. They also had a clothing department upstairs to draw the girls in while boyfriends could trawl through the albums. Vinyl purchases were popped into smart white plastic bags, decorated with illustrator Roger Dean’s artwork (as a fan I actually hung on to some of my Virgin placcy bags and they’ve survived), which became the thing to be seen with at school – despite the fact that the black ink quickly rubbed off on your hands if you weren’t careful. Needless to say the Virgin staff were all almost unbearably hip. One fan still cringes on recalling the looks and smirks from behind the counter when buying a record they clearly felt wasn’t fashionable, but they knew their stuff, what was just out, and what was coming in soon. By dint of the budget nature of the operation, the store was cheaply kitted out with record browsers knocked up out of untreated chipboard to begin with. The air was often hazy due to the joss sticks and the window used to ‘fug up’ with condensation on busy winter days. After the Virgin record label began in 1973; artists like Mike Oldfield, Henry Cow, Hatfield & The North and Faust were heavily promoted in store as they emerged, often with 49p price offers, and free poster on the reverse side of their in-store catalogues. Virgin also promoted gigs at the City Hall, and even had a free concert to promote the album by Gong – in their back yard! We sat on the rubble and were amazed by the music of Planet Gong, particularly the work of the French keyboard player who had all the latest Moog synthesisers. I can’t remember exactly which records I bought there in the early days, though I think I got Deep Purple’s Fireball album there in 1973 as I bunked off school after lunch and was pleased on entering Virgin to see they were just undoing the delivery boxes, and they told me I was the first person to buy the album. One very popular feature of the store was the famous notice board, where local musicians like The Mirror Cracked and NWOBHM outfit Seventh Son would advertise for soul mates to form world dominating combos (Saxon in the latter’s case). This is the store today, which The Yorkshire Bank have taken over. The shop two doors down is empty though, maybe we could recreate it for the fortieth anniversary? Virgin’s stayed at the bottom of The Moor for many years. 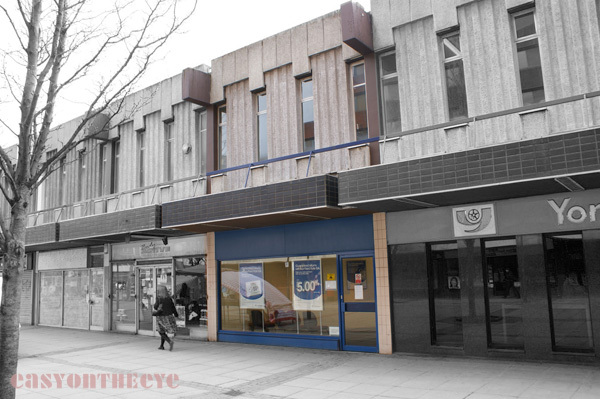 I can’t recall exactly when they moved, probably in the early 1980s, first to a bigger store on High Street in a much more central area, then to the final location as a Megastore on Fargate, which became Zavvi (see separate entry – I’ll cover the other two shops later). It was never the same. Since I first posted this page, more information has come to light. You can see some unpublished images of the original store on the next page, Virgin Part 2. Perhaps one of Virgin’s most important legacies was Barry Everard, who worked at the original store and learned the ropes before leaving in 1978 to set up the legendary Record Collector store in Broomhill, which we will cover anon. Check this page on the site to see some more early Virgin Record store bags. Funnily enough I don’t recall the Presley painting, though it sounds striking. I’d love to see the photo if you ever find it. But while I admit my memory is not great on all things, I do recall being in the store waiting for them to unpack Deep Purple’s Fireball album, and that was issued in 1971. I wagged off school to sneak down and pick it up. But I hope to be able to contact a few people who managed the store soon which should confirm things. It is strange how retail history like this is so ephemeral. Thanks for this Richard. You present strong evidence! It’s so hard to find any proper history (the book on Virgin’s history is absolutely useless). The best info I found said they quickly opened a dozen stores following London in 1971 and Sheffield was one of these. Brighton was another and that has been narrowed down to 1971. Barry appeared a little later on the scene, and can’t recall when it opened. I am still chasing a couple of guys who worked there early on and will see what they can tell me. I’ve checked local business directories but again they are not much use. I guess it’s just possible the DP album I recall was in fact Who Do We Think We Are, which came out in early 1973. Steve Mandy went on to manage the entire Virgin UK retail operation, and also possibly the US stores, but I’ve not been able to track his recent activity down. I would like to see your photo. Richard has kindly sent me his pictures, but I’m hoping he can give me some more information before we post it as it turns out he painted rock stars for other stores as well, so it would be good to get a story from him about how this came about. My first visit there was in the summer of 1973. Nearly bought the Glastonbury Fayre triple album but, when they pulled out the vinyl, it turned out that they had records 1, 2 and… 1 – so no sale. Had had the same thing happen (in a different store) with Yessongs earlier that year for my brother’s birthday in May. Somewhere, I’ve a listing I did around 1976 of where I’d bought every DP and related album. Is it possible that DP album was Burn in Feb 1974? I’m sort of settling on Who Do We Think as it’s in the window of the shop! Plus there was nothing like the same excitement over Burn, more trepidation. Also I listened to Who Do We Think on the floor in the posh room at the family home, pouring over the cuttings on the inner gatefold as I did so. Three tracks – chosen by Paice – were played on the radio a week before Burn came out so I was completely ready for it.Yet he didn’t pick what in time proved to be the big guns – Mistreated, Burn and You Fool No One. I started work for Midland Bank in 73 at Deacon House just behind Virgin and bought clothing from there if thats any help on the year. Just stumbled on this here in 2018. After having worked for Virgin in Bristol in 1974-75, I was offered the assistant mangers job in Sheffield with Barry. The previous assistant had been promoted to a regional job w/Virgin. Steve Mandy was the “new projects” guy who oversaw the new stores construction & training. I had met he & his girlfriend, Wendy (eventually his wife) while they were on holiday in Greece. A few months later, I looked them up in Bath, where Wendy was managing the Virgin store. I was offered a job & started the next day. I worked there for about a year before being offered a position in Sheffield. The day I went to Sheffield to met Barry & interview for the job, he picked me up at the station & dropped me at his house to go back to the station to pick up Kevin Coyne, a Virgin artist that was playing locally that night. Barry went back to the shop & I had to ‘entertain’ Mr. Coyne. Inasmuch as he was traveling by rail and the band traveling by van, it was just the two of us for a few hours. Although I was familiar with his name, I didn’t know his work or anything about him which seemed to work in my favor. No fawning or intimidation, just small talk.The time flew by & I ended up at the show that night. I should add add that Dave Bates was working at Virgin Rags in Sheffield when I was there. After only a few weeks I was summoned to be the as the LP buyer at Marble Arch in London. I became manager shortly thereafter. Soon after the Grand Opening there had been a ‘shake-up’ & a number of key personnel that had set-up & opened the store had left/walked out. So as manager I had to fill some slots. I had known Dave Bates while in Sheffield as a DJ by night & the Virgin Rags shop by day. His musical knowledge of radio pop was pretty impressive, so I called him & challenged him to come to the big city as the singles buyer at Marble Arch. He took me up on it. We shared a flat on Gerrard Place in London’s Chinatown, with a guy named Nick, the cassette buyer. I hope I’ve shed some light on some early history of Virgin Retail in Sheffield. Although my time there was short, my memories are all good. Until this writing I have’t thought about Barry, the manager for a long time. He was going through having lost his assistant manager & then the replacement all while chauffeuring & hosting traveling musicians. I would not change a minute of it & I think he’d agree. Thanks for this Chris, and sorry I missed approving your post before! I will mention your name to Barry when I’m in his shop next, he’s got a good memory! Kids today will probably be amazed that shops had separate buyers for vinyl, cassettes and singles back then. Most shops were just being fed stock from London towards the end and had very little leeway over stocking what local people wanted.